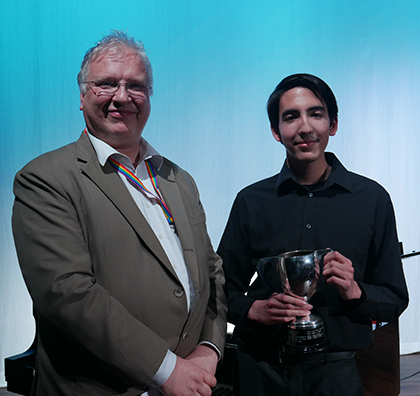 A gifted guitarist at The Sixth Form College, Solihull has been awarded a music bursary from the Heartfield-Wharam Scholarship after auditioning at a public concert last night. Jacob Fulford (aged 18, from Warwick) won the £150 bursary to spend on music tuition from an eminent performer of his choice. He impressed the judges with his performance of ‘Capricho Árabe’ by Francisco Tárrega on the guitar. Also highly commended was Jessica Jaques, who gave an impressive vocal performance of ‘Dear Mr Gable’ by James V Monaco and Joe McCarthy. This bursary was set up in memory of two great musicians who strongly supported music in Solihull and at the College. Roy Heartfield was the original Head of Music at the College, who died in post in 1992, while Margaret Wharam was the former Head of Music at Malvern Hall and Head Organist at Solihull Methodist Church. The first winner of this prize was in 1994 and for the last 23 years the scholarship fund has continued. The judging panel consisted of Music teacher Chris Phelps, Choir leader Margot Cooper (also a Maths teacher at the College) and piano accompanist Chris Collis. The next music concert takes place at Christmas. Tickets are available now for the free Christmas Concert on Wednesday 13 December (7.00pm) by calling 0121 704 2581 or emailing Marketing.